Saint James African Methodist Church has a rich heritage which dates back some one hundred forty-four years. From talking with older members and documenting their recollections, we know there are surely still some missing pieces. However, there are some factors we are certain about and we can document some of them in the records of the Western North Carolina Conference of the Second Episcopal District’s Annual Reports. At a time when people dare not venture too far from the norm, there were seven men in the Method community who took action, by putting their faith into practice. Those seven men: Louis Atwater, Zaney Coggins, Louis Mason, Bennett Powell, Berry O’Kelly, John Rhone, and Henry Wood, saw that land was allocated for the first building in 1872. 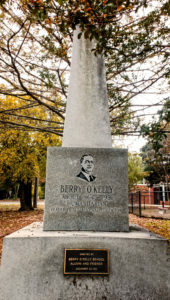 The land was a gift from Berry O’Kelly and the dream would soon become a reality. The early church was founded upon the belief that God is our source and only through faith in him are we able to act. 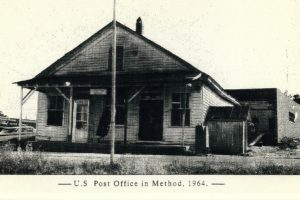 As a result of the unwavering determination and vision, the church became a temple of worship serving the Method community with an outreach ministry. From conversations with older members and documentation from county court records, secular historical archives and reports and records of the Western North Carolina Annual Conference, it has been established as a foundation church since 1872. However, county records indicate that the church had been in existence six years prior to the building of the foundational structure, making the founding year as 1866. God blessed and set His approval over this temple of worship. Though the task had not been overwhelming, it certainly had been a challenge. Through the years, we have kept our focus – Jesus Christ, Son of the true and living God. We have learned how to trust in Jesus, taking him at his word. We have learned how to live holy and present our bodies as living sacrifices which will be acceptable in God’s sight. While many have passed this way and many have been called from labor to reward, their memories will linger forever. Their imprints have been left in the sands of time and the torch has been passed for us to carry on. They knew that God is a rewarded of them who diligently seek him. He will not allow their faithfulness to go unrewarded. God blessed the saints with the spirit of community gratitude in which they lived. St. James became the place where Berry O’Kelly Training School graduation ceremonies were held. The Lord enabled our Brothers and Sisters before us and along with some of us, to purchase a parsonage under the leadership of Rev. Nathaniel Gaylord. Much work, long hours, and self-denial went into obtaining this dwelling. Many days the saints prayed that the Lord would continue to bless the works of their hands. St. James has hosted many activities that were a part of the Eastern District. We through our Sunday School brought home the Sunday School Banner for the District several times. In addition, we hosted the District Conference and Sunday School Convention. Under the mentorship of Sister Shirley Sheares, one of our youth, Sharon Taylor, won several honors in the YPD oratorical contest. At the time of these events, Rev. James N. Sheares was our circuit pastor, along with Piney Grove, and Boyland Chapel AME churches. Rev. Mary Frazier was the Associate Minister, assisting Rev. Sheares during his time here. After serving St. James for more than thirteen years, Rev. Sheares moved up to become the Presiding Elder of the Eastern District of the Western North Carolina Conference. Sister Dora Stroud, blessed by the gift of patience and boldness, made it a point to invite all to come into the church to learn about the Lord. It did not matter whether you were a regular church-attendee, or not. She worked diligently to build both the Men’s Sunday School class and Missionary Society. Sister Stroud was known throughout Method and the AME communities for organizing youth plays and dramas. She encouraged men from the highways to the bi-ways to work for a common goal of making a living and learn about God. Sister Stroud thought it not robbery, to ask that you come and join in her church where she dedicated herself to helping all. St. James had a reputation of helping others, regardless of the situation. Even though the times were hard, Sister Stroud and others joined together to provide spiritual and physical needs of the early church. We must remember the struggle of those who led the way. As we face many challenges today, we must remember that God is the head of the church, not man. We salute our “Founding Fathers” on this, our one hundred and forty-four church anniversary. We humbly appreciate the legacy they left behind. Thank God for the sacrifices they made. Thank God for the inner being that thrust them forward. Despite the lack of modern conveniences, they pressed forward to the mark of the high calling which is in Christ Jesus. We, who are alive and remain, must allow God to continue to mold and shape us. There will be a day when we all will stand before the Master and give an account of the deeds done in this life. We shall behold Him in all of His splendor. We do not believe God brought us this far to leave us. It is our prayer that we always mindful of this fact. We can say like the Israelites, if it had not been for the Lord on our side, St. James would not exist today. God is the source of our strength and joy. God is our everlasting Father, the Prince of Peace, and a Wonderful Counselor. Several pastors labored in this vineyard, toiling, and nurturing the people of God. We are thankful for their efforts in carrying the torch. 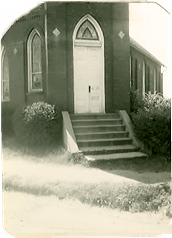 St. James became a station church in 1970, with Rev. James N. Sheares at the helm. To God be the glory! Over the past years, we have completed many projects. The addition of the fellowship hall, complete with furnishings was begun under the leadership of Rev. A. J. Holman, and completed under the leadership of Rev. Randolph P. Lynch. At times it appeared that this task was an uphill battle, but God did it just for us! All glory, honor, and praise, goes to Almighty God!! The fellowship hall was dedicated by Bishop Vinton R. Anderson, Chief Pastor of the Second Episcopal District on June 6, 1999. We are very grateful to the members and friends who helped us accomplish this task. It had been a long time coming, but God saw us through. The Youth Choir was organized in 1984. It was known as the J. C. Atwater Action Choir. This choir was named after Brother Joseph C. Atwater, son of one of our founding fathers, Louis Atwater. The first Mass Choir was organized under Rev. R. P. Lynch. It was made up of members from all church choirs. A tutorial program was also begun under his administration. This program, led by Sister Bessie Walker, helped children understand the art of learning. Many souls have confessed Jesus as their personal Savior and have been added to the church body. St. James’ history would not be complete, without sharing the story of Brother Joseph Clyde Atwater. He was a Trustee, a Steward, and the longest serving Sunday School superintendent, serving for more than 20 years. During his 95 plus years as a member of St. James, he inspired all who came in touch with him. His love for the church was demonstrated through his teachings of Christian values and attitudes. The church was his Alma Mater in spirit and truth. Brother Atwater, left monies to redo the choir loft after his death. He was our longest serving Sunday School Superintendent. We felt a great sense of loss at his “Homegoing”, because he was such an integral part of the church leadership. As we began this new century, we know that God did not bring us this far to leave us. If we trust and obey, his promises are true and the righteous will not be forsaken. God, through his Son, Jesus Christ, has provided more opportunities for us to till souls. Under our current administration, we anticipate that God will continue to not only continue to bless our works, but save souls, and increase our membership. We pray that God will permit our current pastor, Rev. Harry J. Simpson, and the congregation to work in the vineyard to aid our seniors and those in need. Rev. Simpson has brought new meaning and understanding to our church and its members. Our bible study continues to flourish and some have donated individual gifts to the church. We have also purchased new heating and air conditioning units for the sanctuary and fellowship hall, as well as, bibles and hymnals. Our communication styles have also improved, as we have learned to disagree, without being disagreeable. Some of our circuit pastors include, the Reverends Murry, Hadden, Easterling, Wallace, Wisener, J. O. Smith, J. J. Baker, B. H. Lucas, C. C. Scott, B. F. Pickett, A. J. Mattison, Sidney Williams, Josiah Davis, Joseph Hunter, and Nathaniel Gaylord. Our station pastors include James N. Sheares, William Diggs, David L. Morrison, J. Bernard Wilder (current Presiding Elder) Allen Terrell, S. A. Beard, Samuel T. Wilson, Thomas G. Weatherford, A. J. Holman, R. Phillip Lynch, Casimir K. Brown, Kelvin Royster, Harry G. Simpson, Jr., Leodis Strong, and our current Under Shepard, Reverend Phyllis T. Royal. Some of our early pioneer members include: Lonnie and Beulah Atwater, Bertha Edwards, Fred and Florence Hackney, Lorena Money Hall, Ethel Banks Harris, Mary Ida Harris, Jack Hicks, Roxie Parrish Lee, Louise Muckle, Wiley and Lillie Rogers, Savannah Rogers, Hettie Rogers Williams, Ida Thomas, Kathleen Utley, Thomas Wilcox, and Isaac Deck Mason. We also cherish other faithful fallen soldiers: All deceased members of St. James from its inception until this present day. May God’s rich blessings continue to be poured out on St. James African Methodist Episcopal Church.